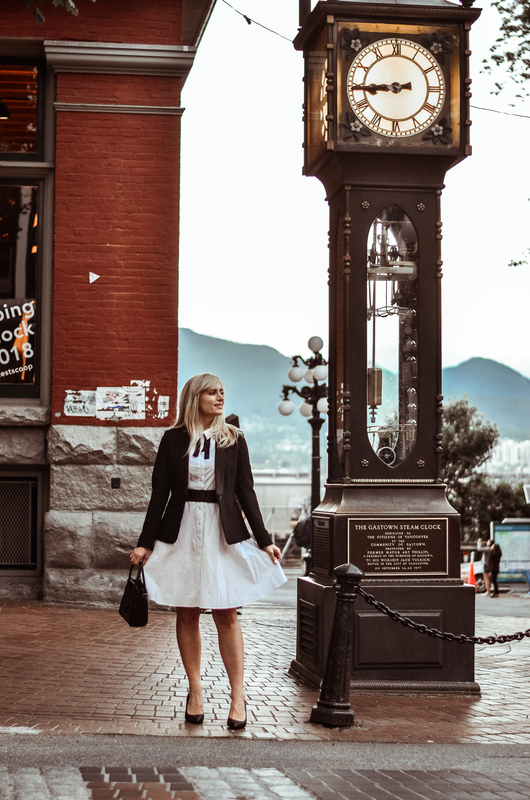 This white shirt dress from Boden has been a staple in my work wear rotation for the past two summers! A classic white shirt dress is definitely a piece I consider a work wear staple. They are classic, but still can look on trend. They look professional while giving you break from a suit (#win). Unsurprisingly then, I plan on wearing this dress, styled as I have it here, a ton this summer. 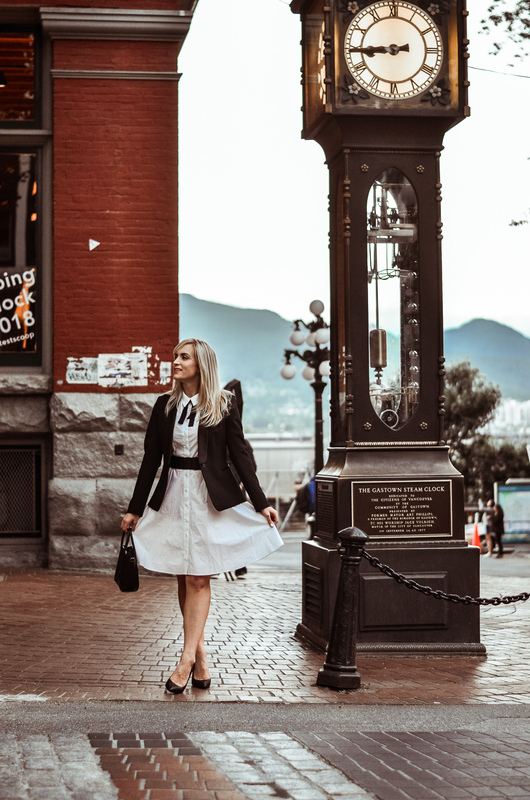 Read on for some white shirt dress style tips and outfit ideas. It’s been interesting to have a piece like this in my closet that I continually wear year after year, because I find myself styling it differently each year. 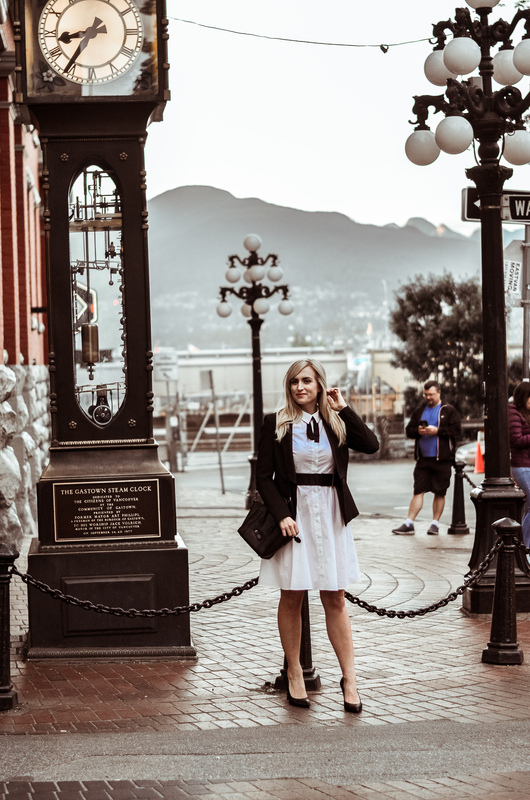 This spring/summer my favorite way to wear this white shirt dress is with a black blazer, a thick black belt and a black ribbon tied into a bow under the shirt collar. In contrast, last summer I wore it a lot with a robin’s egg blue cardigan and a blue and yellow striped ribbon as a belt. It was a soft feminine look. This summer though with fashion trend’s moving more towards classic prep, the ribbon tied into a bow at the collar was such an easy choice. I still wanted to wear a belt because in general I find shirt dresses are more flattering with a belt. It helps break up the look. Sticking with the classic prep fashion trend I went with a wide faux-leather belt for this look. Accessory wise, I went with my ride-or-die black pumps (seriously, I can’t live without these haha) and my look-a-like Celine mini handbag. Goodness how I love this little dupe bag. And for under $50, I am really impressed by the quality. When I have a rare office day where I don’t need to be lugging around a ton of files (the challenges of being a courtroom lawyer) I always opt for a small handbag because I am just so stoked that I can. It’s a nice change not having to bring around 10 pounds of stuff! I’ll link up my exact white shirt dress below, but since I think white shirt dresses are such a must-have item, I have found a few at different price points that I will also link up below. I cannot recommend them enough as wear-to-work item (clearly) but I also love how versatile they are! Here is a look at a weekend outfit featuring this white shirt dress. So versatile! Have a great day everyone and happy shopping! Very cute white dress and something you can wear a ton at work out outside of work!! Love how you styled it with the blazer! Thats exactly what I think! Such a versatile piece. Thanks for stopping by, have a great Friday! Omg how cute is this dress! So chic! Cute outfit, it’s so chic!! This dress is so chic and such a great option for the office! I also love that Celine dupe! You can’t beat that price. Aw thank you Kim! And right?! Such a cute little Celine dupe! Thank you so much! Hope you had a lovely weekend! A white dress of any sort is always a good idea to have on hand. This particular shirtdress is especially cute, and I love that you’ve found so many unique ways to style it! Loving this look on you! So classic and chic. I truly love a white dress. This shirtdress especially seems so handy to keep around. You can style it so many ways and always look chic! I love a good shirtdress! You styled this one perfectly. Aw thanks Anna! Have a great weekend! This outfit is amazing! Shirtdreses are so good for day to night. This dress is so classic and chic, love how you styled it! A white shirtdress is so classic and chic! Perfect for the office. I totally agree! Thanks for stopping by and commenting Laura! That shirtdress is such a classic piece for the office! I switch off between dresses and slacks in my office. Exactly how I feel!! Thanks for stopping by! This white dress is so chic and classic! I love your simple black accessories – they totally complete the look! Aw thank you so much!! Can’t go wrong with classic B&W!